Left to right: Wulf Sternhammer, Johnny Alpha, Gronk. 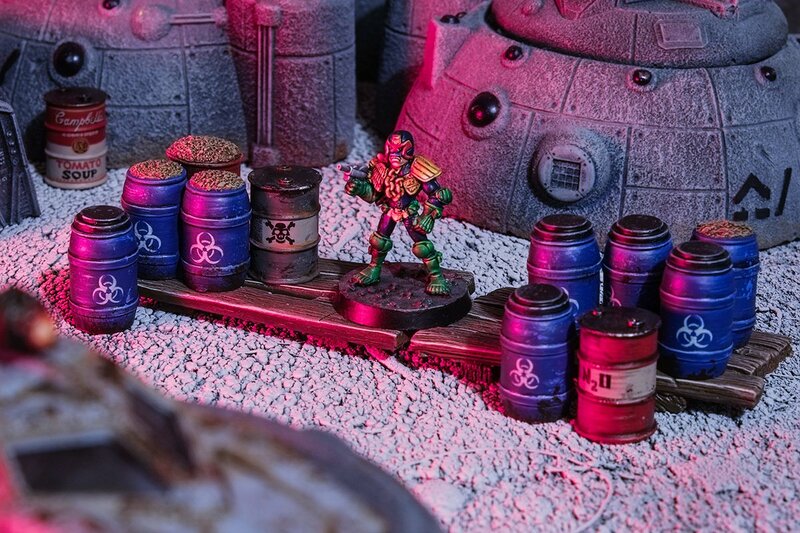 I’ve been painting this triumverate of bounty hunters with an eye on Warlord Games’ new Strontium Dog game. Excitingly they can also be shoehorned into modern Necromunda with the recent bounty hunter rules. The miniatures are from Citadel’s 2000AD range produced for the 1985 Judge Dredd: The Role-Playing Game. Though technically Johnny Alpha and Judge Dredd inhabit separate universes, they have crossed over several times for reasons of awesome. Johnny Alpha and Judge Dredd, Judgement Day, 2000AD #799. The Rogue Trader universe borrows a lot of its overall look from Carlos Ezquerra’s artwork. The amount of time and artwork the Rogue Trader rulebook spends on the (non-Chaotic) random mutations tables is testament to Strontium Dog’s influence. There’s a lot of Strontium Dog wargear that pops up in the forty-first millennium too, such as gravchutes, stasis grenades and electro-mauls. There was a mystery for almost thirty years about the miniature that appears in a single murky black-and-white photograph on page 11 of the Rogue Trader rulebook. The mystery figure, top left corner. The figure never made it into production, appearing only in this photo. Only in 2013 did details of the figure emerge thanks to Steve Casey’s Eldritch Epistles – it was a one of several Judge Dredd figures that had been converted and cast up in-house to playtest the upcoming Rogue Trader rules before actual miniatures had been made. It was released a couple of years later by Wargames Foundry, so people like me and Rochie can paint and play with our own copies of this odd curio. Inquisitor Ezquerra and Johnny Alpha. I plumped for white and papal purple to spin the figure as an Imperial Inquisitor. (It was tempting to paint him in green and yellow trousers, as if it’s Johnny improvising a disguise as an Imperial Inquisitor.) He’s so wee. being from 1985 when sculptors tended to 25mm scale, that I built up his base to help him keep some sense of imposing Imperial authority over the rest of the Imperium’s servants. More vintage Crimson Fists coming soon! Very cool, I did not realize that figure was a proto Johnny Alpha. As you may recall I painted mine in a garish Red, White and Blue theme for Team Terra: Galactic Police. I liked the fact that he was short, I feel he has a Napoleon complex. Inquisitor Xerof Ucks! I didn’t realise that about that figure, either. But more importantly, a very nice tribute to Carlos – sad news on his passing that I read about the other day, but at least his work touched millions directly and many more via his influence that is felt in RT through to much of modern 40k, and through 40k to many other creations beyond. Not too shabby. I managed not to comment on this when it was published. An absolute crime considering how beautiful the three paint jobs are. Incidentally, if Johnny and co can be bounty hunters in Hive Primus, then they could feasibly be recruited by an Inquisltor like Ezquerra or the fantastically named Xerof Ucks, and show up as Inquisitorial henchmen in 40k games too. Which would be a great way to get these slightly short but perfectly formed, and perfectly painted, guys on the table.